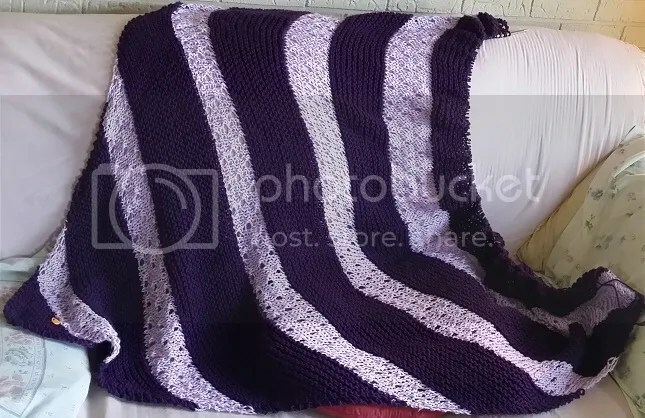 The Heirloom Blanket is FINALLY finished! I just need to weave in the ends, take a picture, and wash it. These spotlights are NOT in order of when I finished the project. I have four panels left to go on this one. That’s it. If I can finish one panel each day- this blanket will be ready for weaving in the ends and washing on Friday. 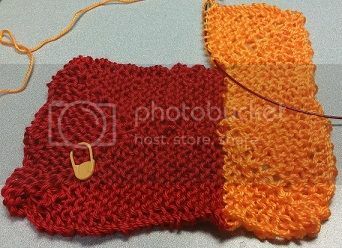 Once the blanket is done, I will need to cast on a few things. 2. My DC monster KAL for week 1 (which I think will be feet). Easy Peasy. BUT Hubby said that I will probably need to make my dad a blanket for Christmas. Hmm… time to start color coordinating ideas. I’m thinking a medium to dark grey and yellow. (His favorite color is yellow.) And maybe a third color as an accent. I’ll think on it. 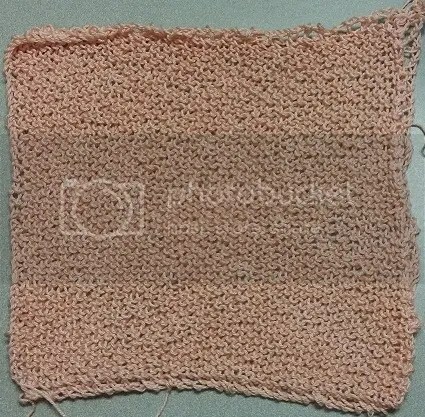 My principal knitting goal for 2015 is complete! My nose always runs like a faucet when it gets colder. 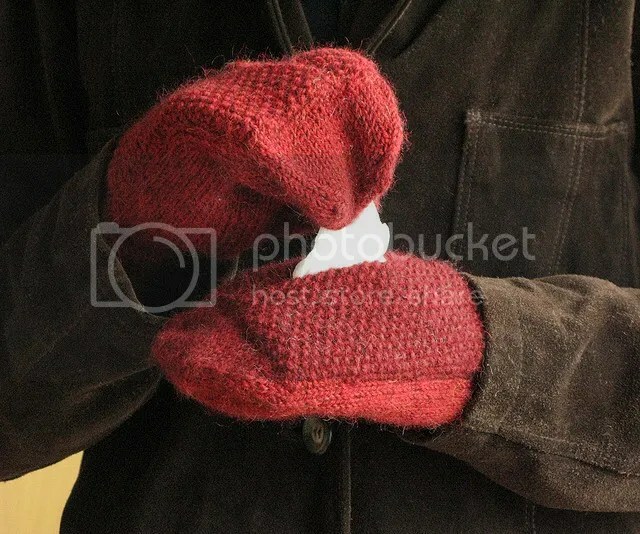 The only thing is that I prefer gloves to mittens. 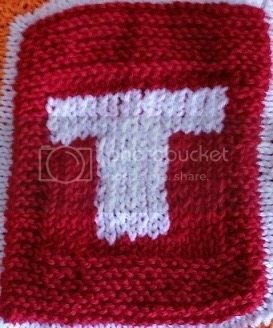 So I’m going to buy the project and see if I can make the pocket a little smaller, so I can convert to fingers. I LOVE THIS BLANKET! It’s mostly Caron Simply Soft, and the colors are soooo fun! I swear- if I were shorter- I would keep this blanket for myself! It’s 36 inches wide by 39 inches tall. But alas- I have already delivered it to my nephew. I hope they love it. This one is slow going. I think critical mass burned away any love I had for it. 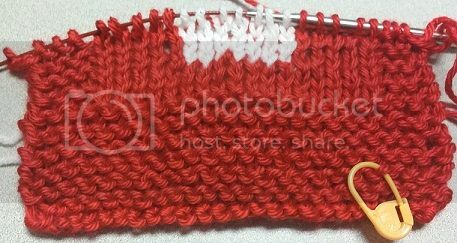 I’m still working on it, but I can only get about four rows before I want to work on something else. It’s amazing how cotton always looks like yarn barf until you wash it. I plan to make two more (and have a set of three). Then I’ll wash them and see if they end up looking any better. If not- who cares! They are just for my use. 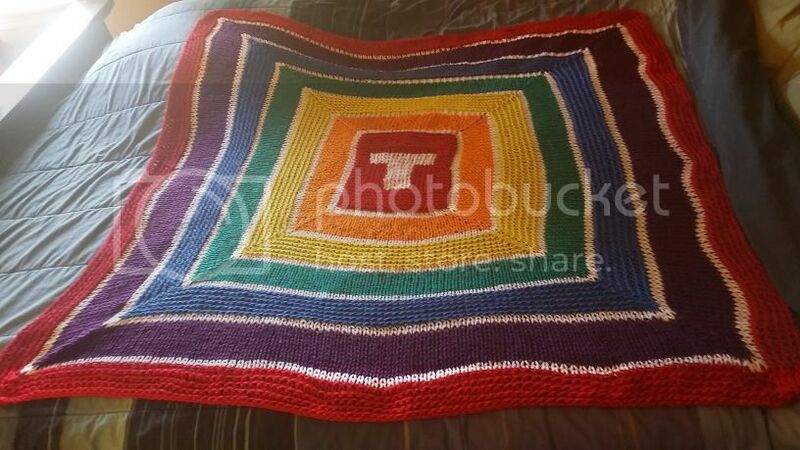 I finished the blanket, and still had a need for rainbow. So I cast on a scarf. It will probably end up being given away, but it’s pretty, so far! Yeah- this one is going to be frogged. I keep thinking I’d like just a little more fitted look. I was a victim of One More Row Syndrome last night. I’m usually not so bad about bedtime, but I spent almost an extra hour, trying to get to the last section of this baby blanket. 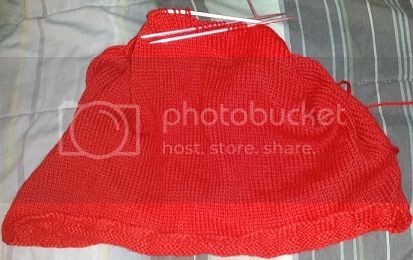 But- in other news – this baby blanket should be done by Saturday! WhoHOO! And… I am happy to report that I am moving right along! I took this picture yesterday, when I was in the middle of the green. I have since completed the green and I am 2 rows into the blue. The colors are sooo vibrant and fun! Okay. 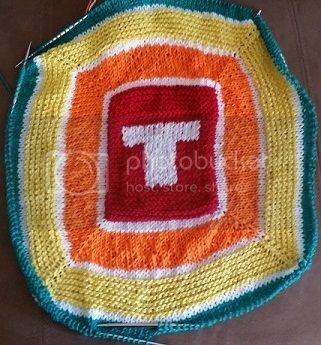 So I changed my mind on Treveon’s Baby Blanket. Although, it’s looking a little Christmas-y right now… but that should be fixed, once I add the other colors. But so far – the foundation square is going well! 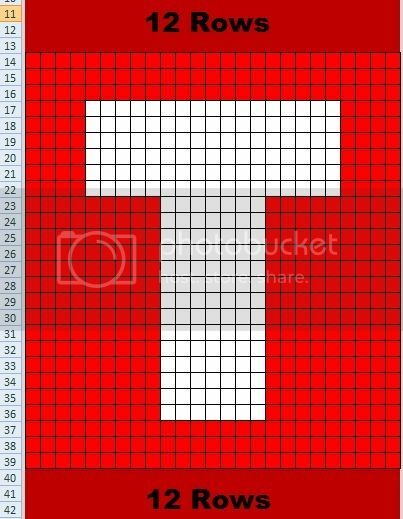 And the white in the center will be a T. You know- T for Treveon. Vogue Knitting patterns on sale! A lot of the patterns are $1.99! There were a couple I’ve been eyeing, so I think I will go snap those up!